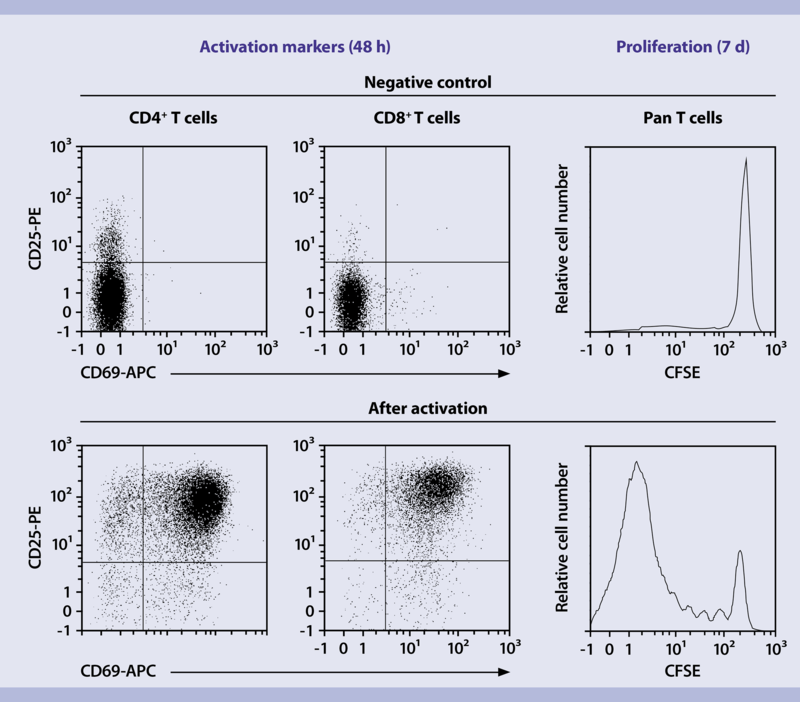 A complete workflow for reliable and efficient T helper cell (TH cell) differentiation, starting with cell isolation of naïve CD4+ T cells and in vitro activation and differentiation, through to comprehensive cell analysis. Miltenyi Biotec provides gentle cell separation strategies, as well as reliable cell culture reagents such as T cell activation tools, T cell media and polarizing cytokines for the efficient differentiation of TH1, TH2 and TH17 cells. Choose from a variety of MicroBeads and T cell Isolation kits for the separation of human and mouse naïve CD4+ T helper cells. The Naïve T Cell Isolation Kits were developed for the isolation of untouched naïve T cells from human peripheral blood or mouse spleen single cell suspensions. Naïve T cells are ready for downstream applications, e.g., in studies on naive T helper cell activation and differentiation as well as and in functional studies of DCs. Isolation of untouched naive CD4+ T helper cells from PBMCs using the Naive CD4+ T Cell Isolation Kit II, human. Cells were stained with CD4 and CD45RA antibodies and analyzed by flow cytometry using the MACSQuant® Analyzer. Naïve CD4+ T cells were isolated from a single-cell suspension from mouse spleen using the Naive CD4+ T Cell Isolation Kit, mouse. Cells were fluorescently stained with CD45-VioGreen, CD4-VioBlue®, CD62L-PE, CD3ε-APC-Vio770™ , and CD44-FITC and analyzed by flow cytometry using the MACSQuant® Analyzer. Cell debris and dead cells were excluded from the analysis based on scatter signals and propidium iodide fluorescence and a gate was set on CD45+ CD3e+ CD4+ cells. 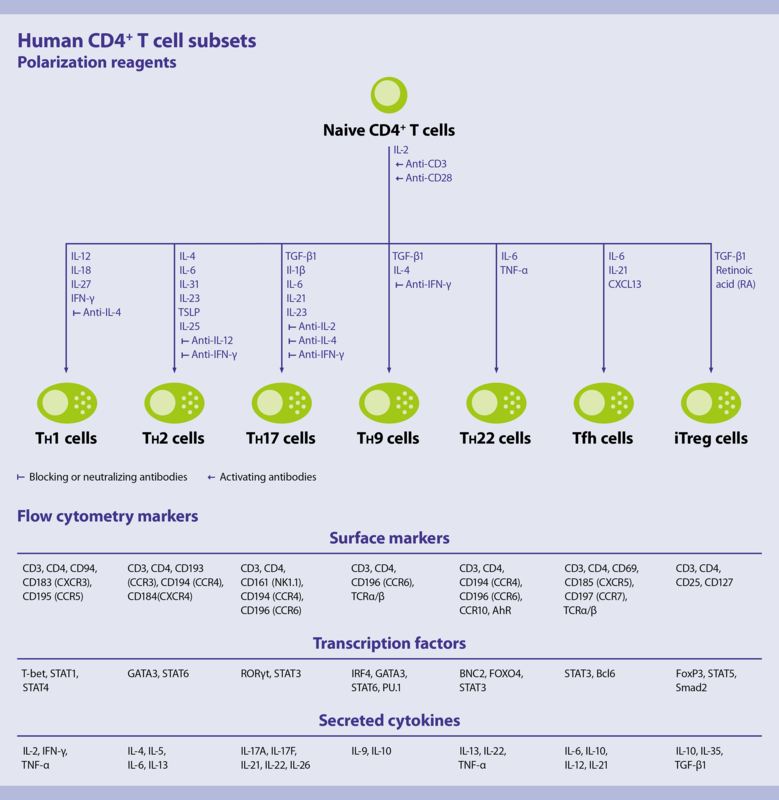 Combine pre-enrichment with the CD4+ T cell Isolation Kits by positive selection or depletion with the respective MicroBeads to isolate even the rarest naïve CD4+ T cell populations. 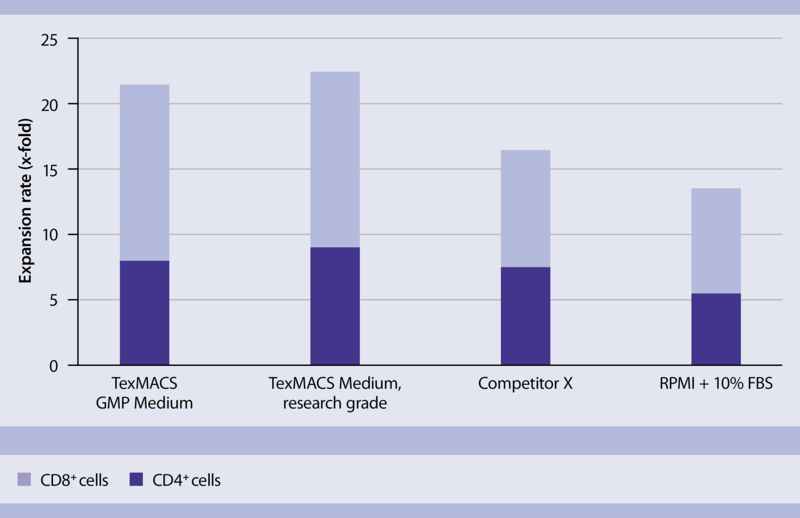 TexMACS™ Medium is an optimized, serum-free cell culture medium, developed for reliable T cell and Treg cell culture results. Chemically-defined and without animal-derived components, it allows for the highest reproducibility in human and mouse cell culture applications. Efficient activation and expansion of human, mouse, and non-human primate T cells or Treg cells. We provide a broad selection of superior-quality cytokines, with high biological activity at a competitive price. Three different grades, research, premium, and MACS® GMP grade, provide flexibility in your assay setup. Activity of Human IL-2 IS, premium grade, (red bar) was compared to another commercially available product (black bar). 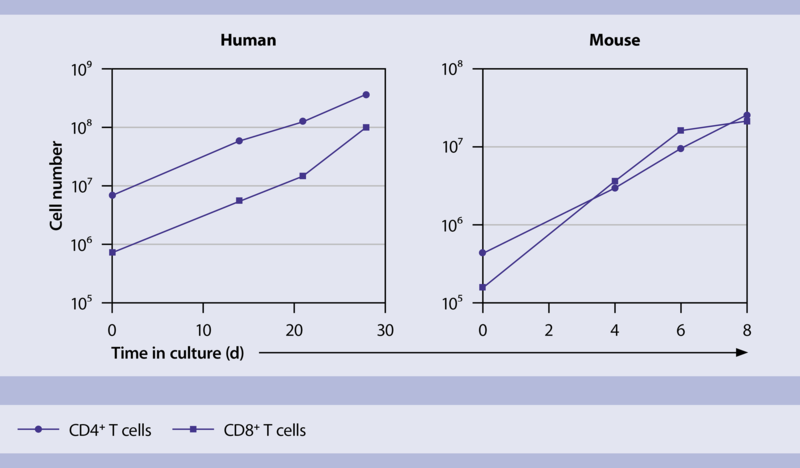 Naïve mouse CD4+ T cells were isolated using the Naïve CD4+ T Cell Isolation Kit, mouse, activated via the T Cell Activation/Expansion Kit, mouse and polarized into TH1, TH2 and TH17 lineages using the respective CytoBox as indicated. Cells were cultured either in TexMACS Medium (+ 10% serum) or RPMI (+ 10% serum) for 5 days . Analysis of lineage-specific transcription factors was performed via flow cytometry on a MACSQuant® Analyzer. 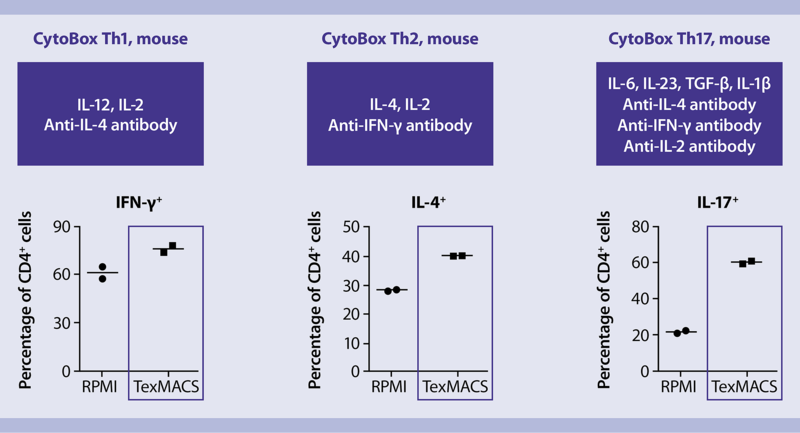 In line with the expected characteristic cytokine expression profiles, the TH1 culture showed a high percentage of IFN-γ–producing, but no IL-4– producing cells. The TH2 culture featured a high frequency of IL-4–, but no IFN-γ–expressing cells, whereas the TH17 culture was characterized by a high level of IL-17–producing cells and the absence of IFN-γ–producing cells. Furthermore, in vitro mouse TH cell subset differentiation in the presence of TexMACS Medium led to higher expression levels of characteristic effector cytokines than culture in RPMI medium. 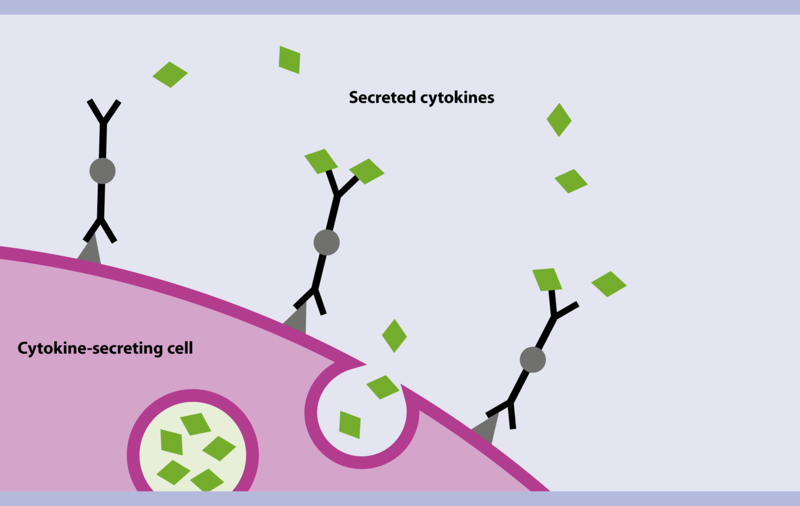 Cytokine secretion assays are designed for highly sensitive detection and magnetic enrichment of viable cytokine-secreting cells. This unique technology enables detection of one antigen-specific T cell per million cells. Isolated cells can be immediately used for downstream applications, e.g., cell culture and flow cytometric analysis. 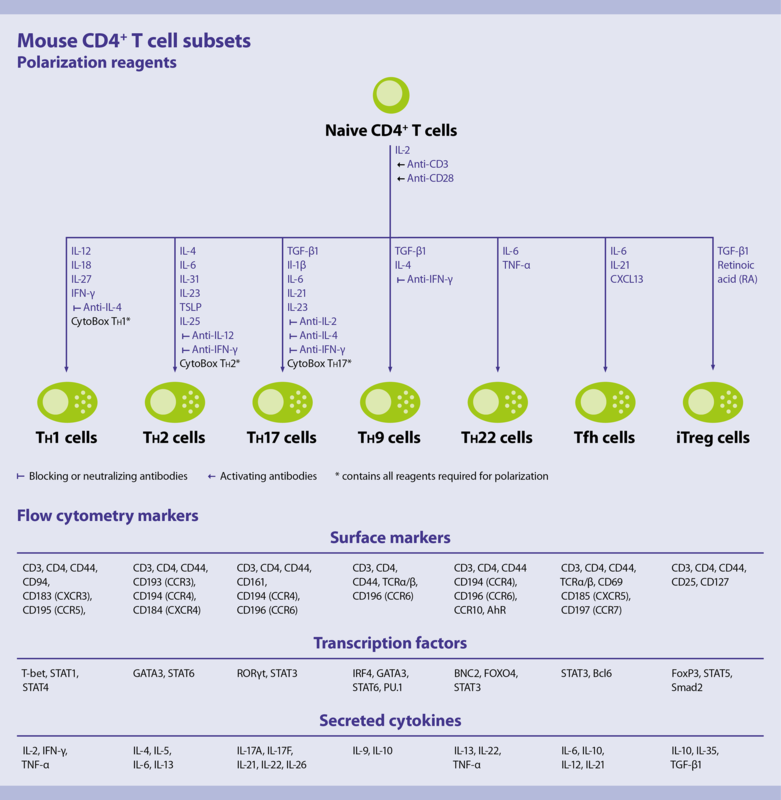 A range of kits are available for human and mouse cells secreting TNF-α, GMCSF, IFN-α, IFN-ƴ, or IL-2, -4, -5, -10, -12, -13, -17, -22. Build your own T cell flow panel with our Flow Panel Builder. Find out more about multiparameter flow analysis of your favorite TH cell subsets.